IAN McAULEY. Watch for Morrison’s next round of economic impression management. Before Christmas the Government will produce the Mid-Year Economic and Fiscal Outlook. It’s a fair bet that it will reveal a small cash surplus for this year, giving Morrison an opportunity to brag about the Coalition’s economic expertise. But this will be a distraction from serious deficiencies in Australia’s economic structure. Some time between now and Christmas the Commonwealth will release a budget document called the Mid-Year Economic and Fiscal Outlook, known by the acronym MYEFO. It’s a routine document, updating the figures in the budget brought down half a year earlier. It would be in keeping with the practice of Coalition governments if, in the MYEFO, as in budget documents generally, the Morrison Government were to focus on the budget deficit, or more specifically the budget cash deficit, known as the “underlying cash balance”. The trajectory of that balance over recent years is shown in the figure below. That shows an economically orthodox fiscal response to the GFC – a major fiscal stimulus at the time of the crisis, slowly withdrawn as the economy picks up. It also shows that this year, 2018-19, the cash deficit is budgeted to be 0.8 per cent of GDP, or $14 billion, followed by a razor-thin surplus next financial year. It’s probable that the MYEFO will reveal a lower deficit for this year, or even a small cash surplus. The deficit is the difference between two estimates, and while governments have reasonably strong control on outlays, receipts are much harder to forecast. In recent months companies have reported strong profits and commodity prices have been unexpectedly high. A three percent increase in receipts would wipe out the deficit. Also, a little fiscal manipulation can shift these figures. Earlier this year (but in the previous fiscal year), the Commonwealth gave a $444 million pre-payment to the private entity “The Great Barrier Reef Foundation”. 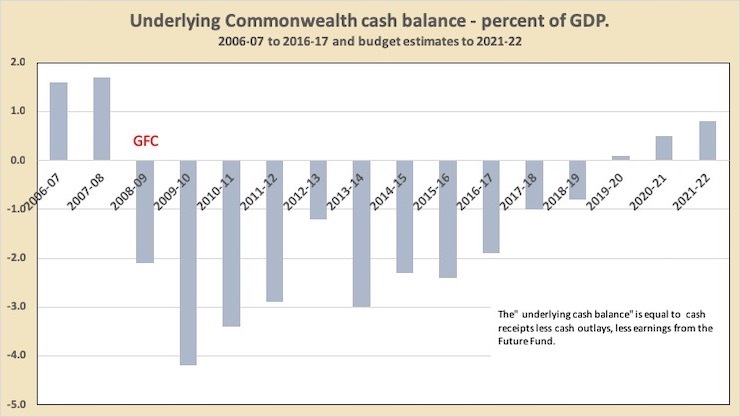 That was a pre-payment, and by most accounting rules, and by common-sense, would be carried forward as an asset, but by the conventions of Commonwealth accounting it shows as an outlay last year, and therefore for this financial year a lower cash deficit. In other words, there is evidence of cosmetic manipulation of the budget figures, in the hope of Prime Minister Morrison being able to announce a surplus one year earlier than previously forecast. This is about impression management – marketing – rather than economic management. There is no intrinsic virtue in a surplus, nor is there any intrinsic failure in a deficit. It would be irresponsible for a government notto operate a cash deficit in response to a downturn such as the GFC. Counter-cyclical fiscal management is an established mechanism of economic stabilisation policy. Persistent fiscal deficits, such as have been occurring in Greece and Italy – and as is now happening in the USA under Trump – where taxation revenue is not keeping up with expenditure, are problematic, but that is not the case in Australia. Nevertheless, the Coalition has presented this fiscal trajectory not as normal counter-cyclical fiscal management but as “budget repair”, as if the irresponsible and incompetent Rudd-Gillard Government somehow broke or damaged the budget – as if it’s a self-evident truth, with no need of explanation, that Labor lacks competence in economic management. The fiscal balance is only one indicator of economic management. No investor in a company would make his or her decision solely on the basis of the company’s cash flow statement, which is the corporate equivalent to the “underlying cash balance”. The investor would look at the company’s profit and loss statement, its assets, the competence of its management, and increasingly the quality of what accountants call its “intangibles”, particularly the quality of the human capital in its workforce. By these broader indicators the Morrison Government, and its Coalition predecessors, have an unimpressive record. Their obsession with partisan point-scoring on fiscal balances has masked serious deficiencies in economic management. Economic management isn’t just about budgeting. That’s the easy part. It should be attending to economic structure, making sure that government policies will help the economy thrive in the long term – a concern that should be particularly important in Australia as we necessarily move from commodity dependence. Australia has several structural fault lines. There has been a degree of bipartisan neglect, but the worst neglect was in the 1996 to 2007 period, when the Howard-Costello Government squandered the benefits of a commodity boom on tax cuts, rather than strengthening the economy for the long run. There has been a failure to invest in infrastructure, particularly urban transport infrastructure, and we are now seeing the consequences in the high costs of urban congestion and a backlash against immigration. There has been a failure to invest in our human capital, particularly education at all levels – from early childhood through to university. There has been a failure to make an orderly transition away from fossil fuel to renewable energy. All governments of this century must take some responsibility, but as the problem has become more urgent the Coalition’s response has become more intransigent. There has been a failure in our taxation incentives, which have seen money poured into real-estate speculation, a doubling in (real) house prices in the last twenty years, and unsustainably high levels of household debt. There has been a failure to rein in the excesses of the finance sector, which has been sapping wealth from the real economy. And most importantly, there has been a failure to support those institutions and mechanisms that protect capitalism from its own destructive excesses and help maintain its legitimacy. Coalition governments have been hostile to the union movement, and have not supported institutions that protect the vulnerable and voiceless from the powerful and politically well-connected. These are the structural concerns that should be at the forefront of our economic debate. But we can be reasonably sure that the Morrison Government, like used-car salespeople who try to bamboozle customers with cleverly-framed figures, will focus on the MYEFO outcome. With the help of the Murdoch media, a surplus, no matter how small or what legerdemains have driven it, will be held up as proof of the Coalition’s economic competence. Ian McAuley is a retired lecturer in public sector finance at the University of Canberra, and, with Miriam Lyons, is author of Governomics: can we afford small government?, which outlines the meaning of economic management. It’s about much more than a few budget figures.